This spectacular entrance hall is technically just that but it's architecture is stunning. 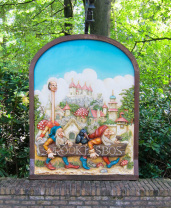 The Fairytale Forest has been part of the Efteling since the very beginning. Come and meet it's inhabitants. Doornroosje (Sleeping beauty) Find out more! Het Kabouterdorp (The Gnome village) Find out more! De Zes Dienaren (The Six Servants) Find out more! Roodkapje (Little Red Riding Hood) Find out more! Pinokkio (Pinocchio) Find out more! De Trollenkoning (The Troll King) Find out more! Het Stoute Prinsesje (The Naughty Princess) Find out more! Raponsje (Rapunzel) Find out more! De Kleine Zeemeermin (The Little Mermaid) Find out more! Draak Lichtgeraakt (The Cranky Dragon) Find out more! De Wolf En De Zeven Geitjes (The Wolf and The Seven Kids) Find out more! Hans En Grietje (Hansel and Gretel) Find out more! Vrouw Holle (Mother Holle) Find out more! Herberg De Ersteling (Inn Ye Firstling) Find out more! De Bruidsjurk Van Guinevere (Guinevere's Bridal Gown) Find out more! Sneeuwwitje (Snow White) Find out more! Assepoester (Cinderella) Find out more! De Kikkerkoning (The Frog Prince) Find out more! De Magische Klok (The Magic Clock) Find out more! De Indische Waterlelies (The Indian Water Lilies) Find out more! Klein Duimpje (Tom Thumb) Find out more! Repelsteeltje (Rumpelstiltskin) Find out more! Het Meisje Met De Zwavelstokjes (The Little Match Girl) Find out more! Kniesoor (Mopey) Find out more! De Nieuwe Kleren Van De Keizer (The Emperor's New Clothes) Find out more! Sprookjesboom (Fairy Tales Tree) Find out more! De Tuinman En De Fakir (The Gardener and The Fakir) Find out more! De Chinese Nachtegaal (The Chinese Nightingale) Find out more! Hop on this ancient carousel and listen to the 100 years old music. This lovely steam train chugs around the whole of the Efteling. Glide through a dream world of castles, elves, woodland spirits, fauns and meet King Oberon. Hugo's house has gone mad! help him with his curse! Go back to yesteryear and play in this old fashioned playground. The Efteling is home to a special group of people – the Laafs. Come and see how they live! The square is home to history and old fairground rides. Raveleijn, a magical city that provides the backdrop for a spectacular park show with real horses and real ravens about five children who become heros. They have each other, special talents and the courage to go to battle with a tyrant. But how do they beat him? 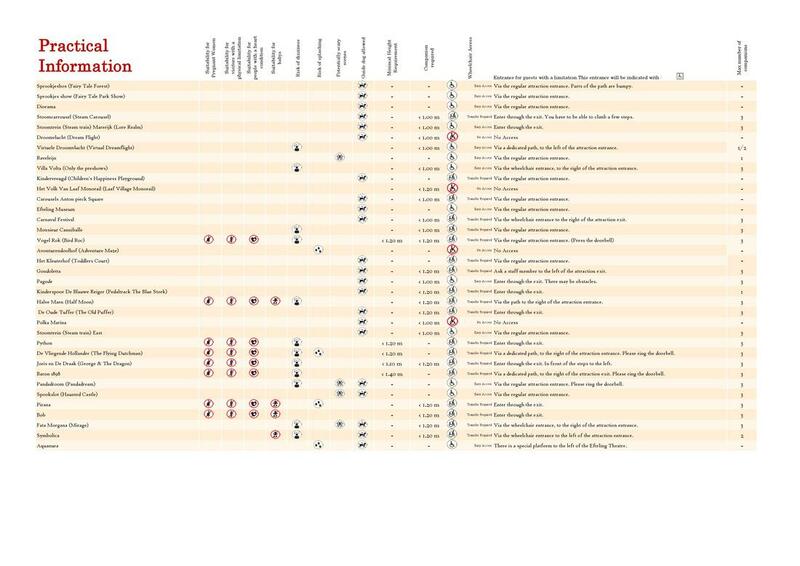 Below you can find an overview of the accessibility of the various attractions. Here you can also find a number of videos illustrating how to access them.